F & G period: F & G period students were taken through the same lesson as A period students experienced on Thursday (see May 10th). 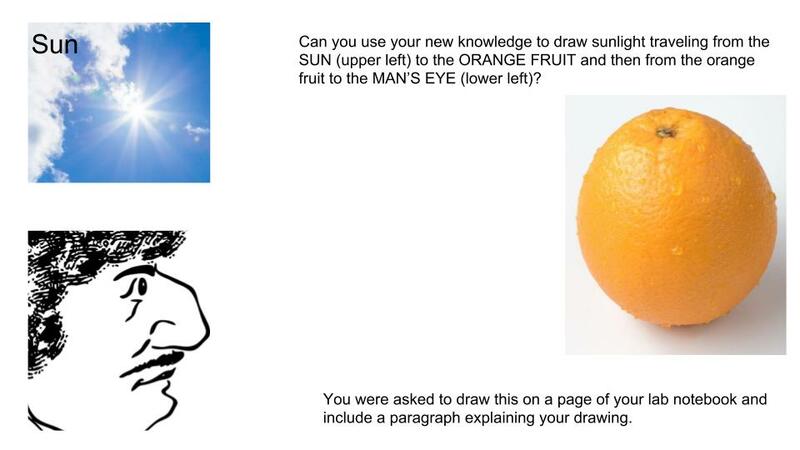 Homework: The F & G period homework is shown and explained in the two images seen below. You can click on either of them to see a larger image. F & G period: F & G period students were taken through the same lesson as A period students on Wednesday (see May 9th). Homework: F & G period students have no science homework tonight. When light hits objects it is reflected, the angle of incoming light is equal to the angle of outgoing light. Light reflected from a smooth surface is less scattered. Light reflected from a rough surface is more scattered. Homework: The A period homework is shown and explained in the two images seen below. You can click on either of them to see a larger image. Image 1 – you may print this image, draw on it, and put it in your lab notebook if you wish. Image 2 – you may print this image, draw on it, and put it in your lab notebook if you wish. Light is a stream of very small packets of energy called photons traveling very fast. Light travels in straight lines, until it strikes (hits, touches) an object such as a solid, liquid or gas. The speed of light is much faster than the speed of sound. Light hits objects and is reflected. The angle of incoming light is equal to the angle of outgoing light. Homework: A period students have no science homework tonight. G period: G period students were taken through the same lesson as A & F period students on Tuesday (see May 8th). 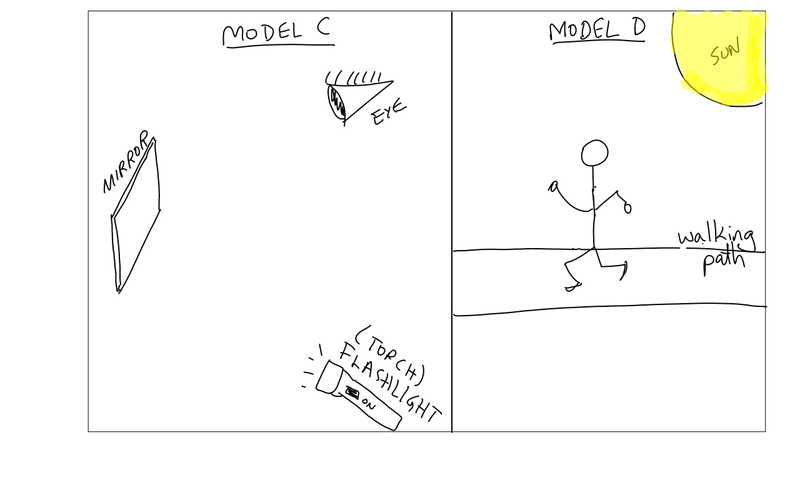 Homework: G period students have been asked to complete the four models (A-D) by adding light to each of the diagrams. Students need to decide for themselves how they wish to draw light (e.g., what colors and shapes they use to represent light) and how they wish to make light behave (e.g., does it pass through objects? does it ‘bounce’ off objects? is it absorbed by objects?). Today in science: After a brief discussion of both physical and mental “models” and their usefulness in science, we used four blank pages of our lab notebooks to begin recording our ideas about light and light travel. With the use of four hand drawn diagrams, Dr. Merritt asked students to access their mental models of light to complete each of the four diagrams. In completing all four models, students were encouraged to use labels, phrases, and short sentences to help clarify and supplement their diagrams. The four diagrams are reproduced below. 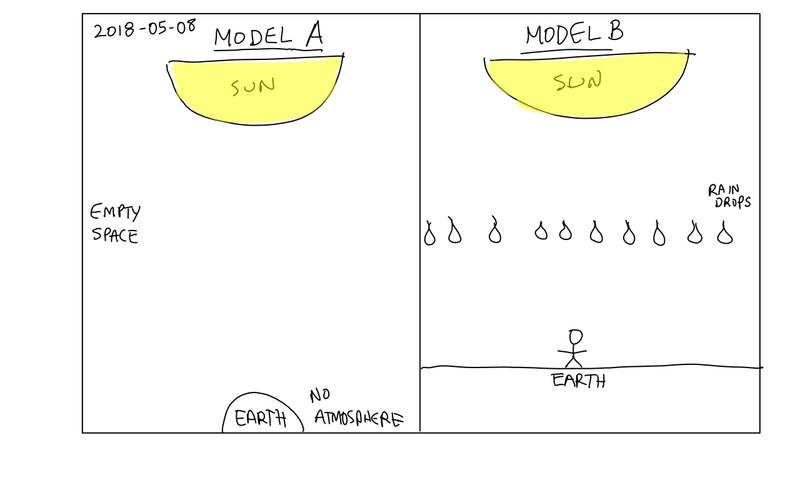 Homework: A & F period students have been asked to complete the four models (A-D) by adding light to each of the diagrams. 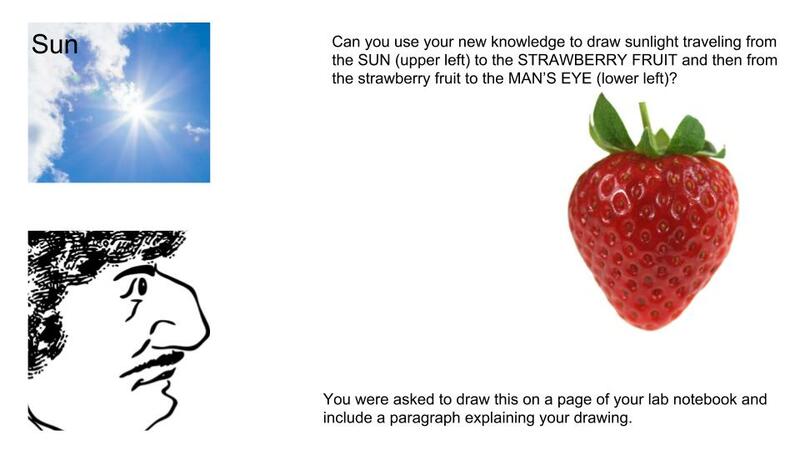 Students need to decide for themselves how they wish to draw light (e.g., what colors and shapes they use to represent light) and how they wish to make light behave (e.g., does it pass through objects? does it ‘bounce’ off objects? is it absorbed by objects?). Today in science: At the beginning on class, Dr. Merritt collected any/all revisied atmosphere maps. The bulk of today’s science lesson was based on the story contained within Monday and Tuesday’s blog entry on SCIENCEsEDiment.